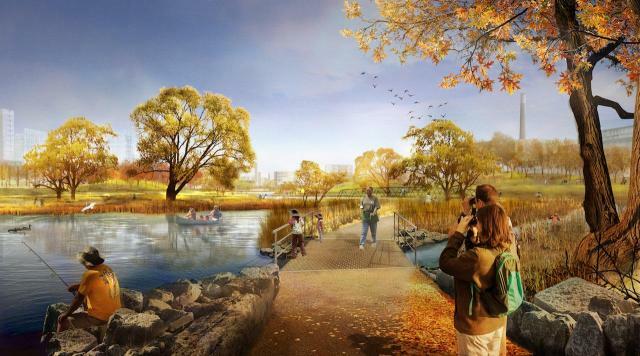 Innovative mixed-use communities will be created around a new naturalized and flood-protected mouth of the Don River. The Port Lands, or Lower Don Lands, is a 125 hectare (308 acre) area that runs from East Bayfront (the Parliament Street Slip) east to the Don Roadway and from West Don Lands (the rail corridor) south to the Ship Channel. Waterfront Toronto plans to transform the largely underutilized industrial area into new sustainable parks and communities. The naturalization and shifting of the mouth of the Don River is the centrepiece of the plans for the Lower Don Lands. The plans would see the Don River's mouth moved from its current location at the Keating Channel on the eastern side of Toronto’s inner harbour. The river would be re-routed through the middle of the Lower Don Lands between the Keating Channel and the Ship Channel. This would result in the Don River once again becoming a major feature of Toronto’s waterfront and the centrepiece of new mixed-use neighbourhoods and parks and green spaces in the Lower Don Lands. The changes to the river mouth would also provide the flood protection necessary to enable development of the immediate area and the larger Port Lands. Waterfront Toronto’s plans were developed through a comprehensive environmental assessment process which has included the examination of several alternative planning solutions. The plans are rooted in planning designs developed by Michael Van Valkenburgh Associates as part of the international design competition for the Lower Don Lands held by Waterfront Toronto in 2007.